Wishes are delivered in the most stunning way by gifting this Remarkable Celebration Treat with Fresh Fruits for lovely people in a lovely way. 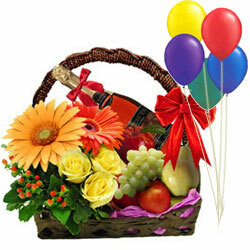 This Gift Basket will be long enjoyed and appreciated as it is teamed with Apple (Net Weight- 1/2 Kg. ), Pears (Net Weight- 1/2 Kg. ), Grapes (Net Weight- 1/2 Kg. ), 3 Balloons, 10 Mixed Flowers and 1 Bottle of Sparkling Fruit Juice. Note: Brand of the Sparkling Fruit Juice may differ depending on the availability in the city of delivery.